This is the third post in my series of Pre-New Year’s posts about how to start or increase healthy habits like hiking, healthy eating, yoga and meditation. I practice meditation (almost) daily myself, but I’m no expert so I asked my friend Kimberley Puryear, E-RYT-500 yoga teacher who has been practicing & teaching yoga and meditation for over a decade and has even practiced in the presence of meditation masters like Thich Nhat Hanh. She is currently the lead instructor for Asheville Yoga Center’s 200-hour and 300-hour Teacher Training programs, where she received her own certifications. If you want to practice with Kimberley, she leads a weekly Tuesday 5:45-7:00 PM Yin Yoga class that is open to the public at AYC. She has also expanded her skillset by becoming a licensed massage therapist at the Asheville School of Massage & Yoga. Learn more about Kimberely and/or contact her via The Steadiness Project website. The hardest part of meditation is getting started. 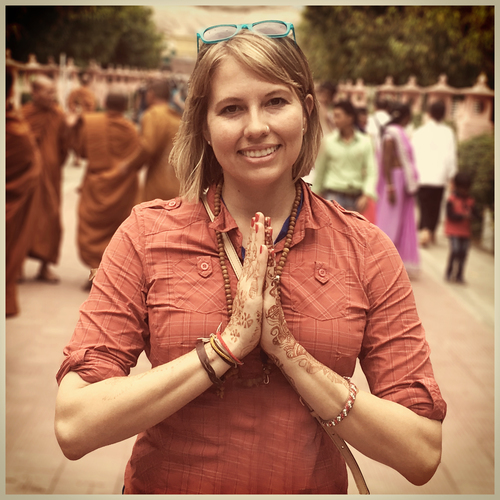 I’m grateful that Kimberley has graciously shared lots of advice and given simple, straightforward answers to the most common meditation questions that beginners tend to have. What is meditation about and/or where did it come from? Meditation can be said to be a way to transform the mind from its usual busyness and hamster-wheel of activity to a more spacious, open and relaxed state. Most forms of meditation encourage and develop one pointed focus (or concentration), clarity, and a calm way of seeing the things as they are and not just how we want them to be. With consistent practice you learn about all the ways your mind has developed conditioned patterns and habits, and offers ways to live in a more awakened, positive, and compassionate life. Is there more than one type of meditation? There are many types of meditation and it is recommended to find a style the resonates with you and practice it consistently and for a time to see if it’s a good fit (6 months or more). Some forms of meditation use concentrative techniques such as focusing on the breath, a mantra, or visual anchor (such as a candle or mandala). How do I start meditating? How long until I see some results? Like anything else, rooting into a meditation practice takes willingness and disciple. The results come in time and with dedicated practice. The effects are subtle at first but over time become more and more noticeable. When to meditate is a personal preference and will vary from person to person depending on their schedule and lifestyle. Many people find mornings before breakfast to be a good time to sit. After a restful night’s sleep, the mind is typically less cluttered and discursive. Meditating in the morning helps set the tone for the day. In other words, a few moments of quiet before the busyness of the day begins may help to keep our day from overwhelming us. If you’re not a morning person, don’t fear! You can also take some time to meditate if/when you’re feeling stressed or anxious. It’s a portable practice that can be done anywhere and is a wonderful tool to employ “in-the-moment” as needed. Meditating in the afternoon, on your lunch break, at the close of your workday, or before the kids get home from school are also great times to stop, sit, and breathe. Most longtime meditators agree that meditating before bed is not recommended as this is a time of winding down and we are often sleepy. In meditation, we are not try to relax ourselves to sleep, rather the opposite- we are trying to be awake, alert and in the moment. Where should I meditate? Is it best to meditate in the same place? While it is recommended to find a clean, comfortable and quiet spot to sit, meditation can really be done anywhere you are and at any time. Having a consistent space and time to sit will help root the practice into a daily routine and give you a place that feels peaceful, safe, and exudes stillness. “A little + often = A lot.” Start slowly. Just a few minutes a day at first will yield more results then trying to sit for an hour only one a week. It typically takes about 10 minutes for the chatter in the mind to settle, so aim for at least 10 minutes. When that starts to feel comfortable, feel free to add more time (15, 20, 30) but please know that 10 minutes a day will do. Should I stick to one meditation technique or try many different ones? “It is better to practice one thing 10,000 times then to practice 10,000 things one time” (Bruce Lee…maybe?) At first it may take some investigation into different techniques, but one you settle on one, practice it daily. Trying a bunch of different styles every time you sit doesn’t offer the depth and benefit that sticking with one style for an extended period of time will. What are the most common obstacles to meditation and how do I overcome them? The biggest obstacles to meditation are illness, sleepiness and laziness (which includes discouragement and busyness/procrastination). Obviously if we are sick, trying to meditate will be fruitless. When we are sick, it is best to rest. It’s the same with sleep. If we are sleep deprived, any time we stop to find stillness will be an opportunity for the body and mind to try to rest. Meditation is merely highlighting the need to adjust your lifestyle so that you are getting adequate restoration. The antidote to laziness is consistency and discipline. Set an aspiration to practice each day and arrange you priorities around it. I have found that meditation doesn’t take time, it creates time by highlighting the ways that I distract myself. For example, spacing out on social media, watching too much television, filling every moment with phone calls or chatter, etc. How do you know when meditation is working? The benefits of meditation are many! It may help reduce stress, improve sleep, decrease symptoms of depression, anxiety and pain, lower blood pressure and enhance self awareness and much, much more! Consistent meditation practice is ideal for reaping these rewards. You’ll slowly start to feel less reactive, more spacious and clear. You just have to stick to it. What are some tools/resources you recommend to help me start and maintain my meditation practice?